Today’s entry into the “Water Foul” spotlight on awful aquatic monster flicks is The Last Shark, likely the most notorious of the Jaws knock-offs. 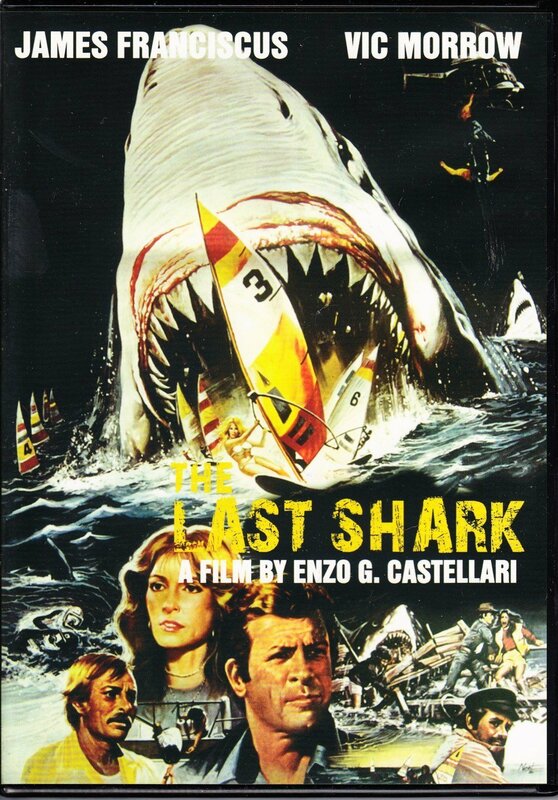 The Last Shark had three credited writers: Vincenzo Mannino (Hallucination Strip, Murder-Rock: Dancing Death, The New York Ripper), Marc Princi (The Squeeze, Terror Stalks The Class Reunion), and producer Ugo Tucci (Zombie, Once Upon A Time In The West). The director of The Last Shark was Enzo Castellari, who also directed 1990: The Bronx Warriors, The Inglorious Bastards, Keoma, and The Shark Hunter. The cinematographer for the film was Alberto Spagnoli, who shot such films as the Italian Lou Ferrigno Hercules movies and Peter Bogdanovich’s Daisy Miller. The editor for the movie was Gianfranco Amicucci, who also cut a number of Castellari’s other films, including Keoma, The Inglorious Bastards, and 1990: The Bronx Warriors. He also went on to edit a number of Ruggero Deodato (Cannibal Holocaust) movies, including The Washing Machine and Mom I Can Do It. The music for The Last Shark was composed by Guido and Maurizio De Angelis, who contributed scores to a number of other low-budget features like The Shark Hunter, Keoma, and Alien 2: On Earth. Aside from co-writer Ugo Tucci, the producers for The Last Shark were Maurizio Amati (Cannibal Apocalypse), Sandro Amati (The New Gladiators), and Edward Montoro (Pieces, Pod People, Anthropophagus, Grizzly). 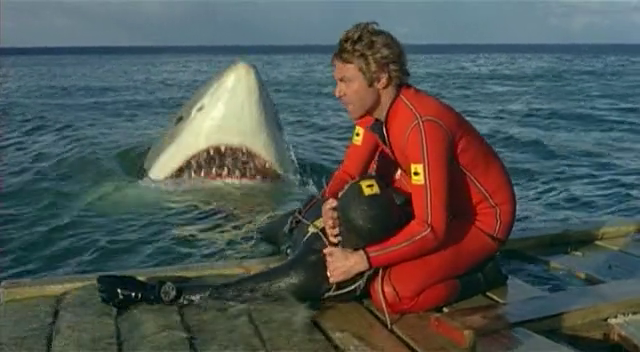 The makeup and special effects for The Last Shark were done by Giovanni Morosi (Inglorious Bastards, Escape From The Bronx) and Antonio Corridori (Mission Impossible III, Piranha II, U-571, The Italian Job). The cast of The Last Shark included James Franciscus (Beneath The Planet Of The Apes), Joshua Sinclair (Judgment in Berlin, 1990: The Bronx Warriors, Keoma), Vic Morrow (1990: The Bronx Warriors, Twilight Zone: The Movie), Giancarlo Prete (Bad Cop Chronicles, Escape From The Bronx), and Stefania Goodwin (1990: The Bronx Warriors, Super Mario Bros.). The plot of The Last Shark surrounds a string of shark attack deaths off the coast of a tourist town, but an ambitious local politician refuses to close the beaches due to an upcoming wind-surfing event. After the event turns into a tragedy, the whole town goes into a frenzy trying to catch and kill the crazed, monstrous shark. 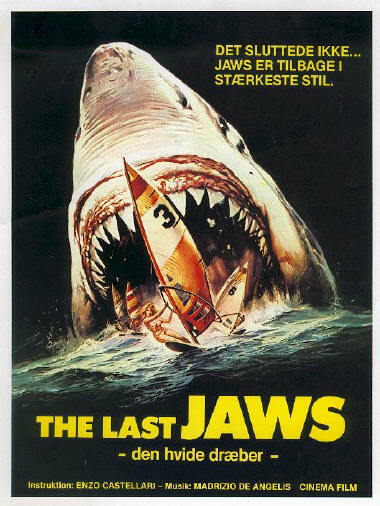 As you might suspect from that plot synopsis, The Last Shark was marketed as a Jaws sequel in a handful of foreign markets, while being titled Great White for its release in the United States. Regardless, Universal Pictures filed a lawsuit against the production for being too similar to Jaws, which led to an injunction and the film being pulled from theaters. A sequel to The Last Shark was at one point planned, but the shark was too heavily damaged during the production to re-use, and it was decided that it wasn’t worth the trouble to create a new one. The reception to The Last Shark was roundly negative: it currently holds a 4.6 rating on IMDb, alongside a 35% audience score on Rotten Tomatoes. I wasn’t able to dig up a number for the budget on The Last Shark, but I assume it was pretty low. Primarily due to piggy-backing on the popularity of Jaws, the film grossed 18 million in its United States theatrical run (despite being pulled from theaters), making it significantly profitable on the whole. To the credit of the politician character in this movie, he at least does more than the mayor in Jaws. Instead of outright refusing to acknowledge the shark attacks, he surrounds the beach with shark-proof netting to provide a sense of security for the locals participating in the wind-surfing event. Of course, this doesn’t wind up working, but it is certainly more effort than doing nothing. The music for this movie is all over the place, and even opens with an upbeat and pop-inspired number. It just doesn’t fit with what should be a thriller or adventurous soundtrack, and is a huge departure from the classic Jaws score. Most of times the shark is shown on screen in The Last Shark, it is done with stock footage. However, a mechanical shark is used occasionally, and looks absolutely terrible. They would have been better off just not bothering with underwater footage of the replicated shark at all. All of that said, there is some extensive miniature work in this movie that, in my opinion, doesn’t look excessively terrible, particularly when compared to the CGI shark nonsense we get today. At one point the shark takes out a helicopter, which is simultaneously awesome and hilarious. However, nothing stands out quite as much as the ultimate shark death at the end of the movie. Overall, The Last Shark is a pretty entertaining watch, particularly for fans of Jaws. The film is so not-subtle about being a knockoff that sequences are basically lifted straight out of Jaws and thrown into this movie. It is certainly understandable why Universal wasn’t thrilled about this movie, because it takes more than a few steps too far. As far as entertainment value goes, the shark and miniature effects are hilarious, and the actor playing not-Quint is pretty entertaining. 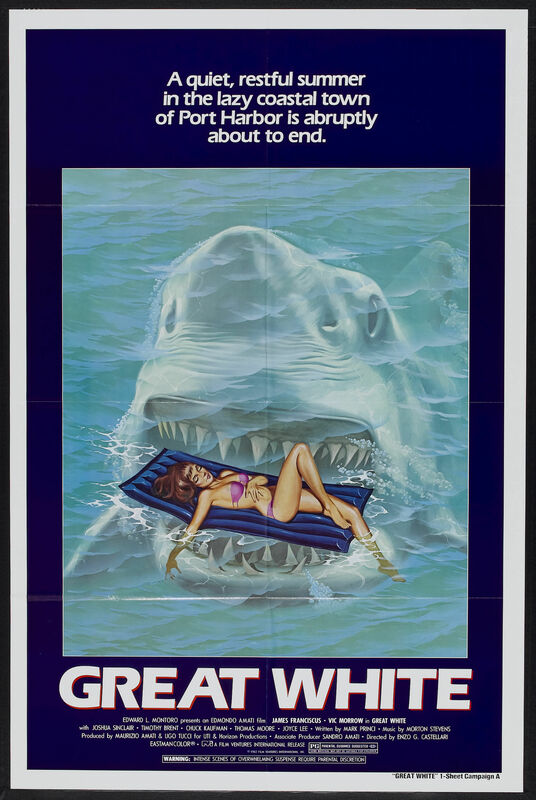 This is a movie worth digging up if you want to watch an old school cheap shark movie that wasn’t made by Syfy and The Asylum.